Emily's Journey to Midway: How it all began..
Hi I'm Emily Chartrand and I'm 17 years old. I am about to tell you a bit about my story, through life as a teenager, business owner and environmental activist. This has been an eight year journey that has brought much happiness, tears, laughter and aspiration to bring upon change into my life. It all started eight years ago when I was nine, and my big sister Chanel was twelve years old. Money was tight in my family that year and both my sister and I wanted to be able to give our teachers a nice Christmas gift. This is how Snowman Poop was born. We created a chocolate dipped spoon in a bag with marshmallows to accompany your hot chocolate. Our teachers absolutely loved the product and my family and I being such bold thinkers, thought that maybe we could sell the Poop to get a few extra dollars around Christmas time. We approached six local stores, they loved the product and sold it for two winters. We dipped over 800 chocolate spoons and heard wonderful stories of people who had sent the poop to family and friends all over the world. From a very young age my mom and dad have taught my sister and I that giving back to society is very important. Snowman Poop enabled us to give back to the world in ways we never could have imagined. 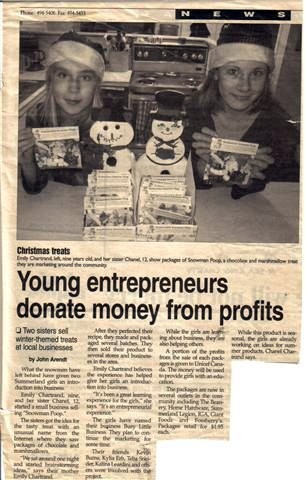 For the 2 years of selling Snowman Poop we donated hundreds of dollars to a Unicef educating girls program. To make a very long and exciting story short, over the past seven years we have stuffed over 10 thousand packages of Ogopogo Poop and have supplied over thirty stores and visitors centers in BC with our product! Though Ogopogo Poop my sister and I have also become world travelers. The business enabled us to travel to Montreal to visit our family and to Puerto Vallarta, Mexico twice to help the Children of the Dump. We brought 200 pounds of humanitarian supplies, helped a family renovate their small home by providing a septic system, water tank and concrete floor and we supplied money for 2 girls to go to computer school. Although I wasn't living in the slums of Calcutta, or somewhere facing far more intense poverty, these experiences weren't easy for an 11 year old to see. I wasn't accustomed to seeing adults and toddlers alike running around in a garbage dump without shoes, scavenging for anything that they could take to sell or to eat. Their main focus is on the thousands of Albatross birds who are dying every year with bellies full of our plastic waste. It was a huge eye opener which inspired me to reevaluate my values and business direction.I was so moved by this presentation, I became very involved in this cause and I now serve the many Plastic Free committees and I created one at my high school. After much careful consideration my sister and I felt that we could no longer, with good conscience sell a product that is packaged in plastic. We have explored environmentally friendly packaging alternatives and found them all too expensive. So after packaging over 120 thousand jelly beans, we felt it was time to call it a day! With a few tears we officially closed the Ogopogo Poop business a few months ago. I am extremely grateful for this incredible and life changing experience from which I have learned so much. Now to the point of my blog. In just 9 days I will be traveling to Midway Island with Jan Vozenilek and the Midway Journey team. I ask that you would please follow me on my journey to highlight and bring attention to the devastating affects that plastic is having on the earth. On this journey I know there will be tears, sorrow and laughter. But ultimately I know that I will come home a new person, more connected to the earth and ready to take on the problems we are facing as generation X and Y. Well done! we look forward to seeing this issue through your eyes! Emily, I applaud what you are doing. I was also a resident of Midway in the mid '60's as a military dependant. 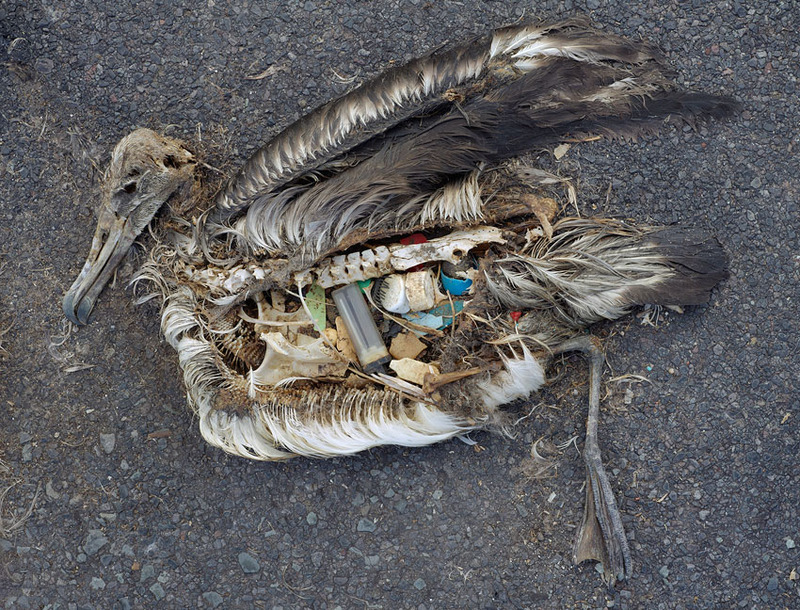 We lived and played among the gooneys, and it's heartbreaking to see, now, what our plastics have been doing, not only to these birds, but wildlife around the world. I hope this generation will find a solution to restore the damage we've done. Thanks! Hey Emily...congratulations. Can't wait to hear all about this amazing contribution/adventure! I love that you are taking such a responsible journey to the future of our beautiful planet Earth. Thank you for your care, concern and accountability. Hi Emily, Saje again. After reading your posts and about the earlier and wonderfully inventive years of your life, I want to say to you that I am sure you will find the most creative ways to take what you feel and are experiencing out into the world, to share in a powerful and transformative way. You have so much integrity in everything you do - I am happy your are here on planet earth. Hi Emily.. My name is Tara Farrell and I'm an Education Assistant at Skaha Lake Middle School. Well, I had the PLEASURE of hearing you tell your story earlier today. Fantastic job girl.. :) You really are inspiring.. (I'm sure you hear a lot of that).. But, I think you did an amazing job keeping the attention of a full gymnasium of grades 6,7,and 8. You spoke so clearly, with so much passion, yet you also are very soft spoken.. I heard every word!!.. yeah, the students were that quiet.. :) Doesn't happen too often.. that I hear every word.. and I know they did too.. Quite an accomplishment in itself.. lol. And I loved the 'Obama movement' reference.. lol.. The staff really enjoyed that.. :) Keep up the great job Emily.. I can't wait to see you agian..